Batwoman is to make her comic comeback as an openly gay superhero. DC Comics writer Greg Rucka told Comic Book Resources she was "a lesbian socialite by night and a crime-fighter by later in the night". Her appearance coincides with a battle in Gotham City to take over Batman's cowl after he was seemingly killed off in November. Batwoman and her alter ego, Kath Kane, will appear in at least 12 issues of Detective Comics from June. "We've been waiting to unlock her - it's long overdue," Rucka said. "Yes, she's a lesbian. She's also a redhead. It is an element of her character. It is not her character. If people are going to have problems with it, that's their issue. That's certainly not mine," he added. Rucka admitted the hero's sexuality would cause some controversy saying: "I think there is going to be some media - I can't control it. "You've got to remember, Wonder Woman got a haircut and that became news. So it will be what it is. Our job is to make the best issues of Detective that we can." 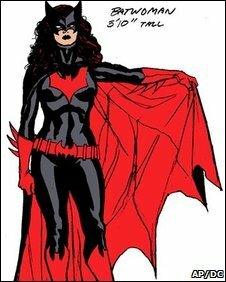 Batwoman was originally introduced to the DC comic world in 1956 as a love interest for Batman and has made cameo appearances in the comic series. She was first outed by her creators in 2006 as a former lover of Gotham City police detective Renee Montoya and her elevation to alpha superhero has been celebrated by gay rights groups. The Gay and Lesbian Alliance Against Defamation praised DC for their efforts to diversify their characters.